Washington (CNN) - A majority of Americans say Israel's military actions in Gaza are justified, with only four in 10 saying that Israel has used too much force, according to a new national poll. But a CNN/ORC International survey conducted Friday through Sunday also indicates that favorable opinions of Israel have edged down since earlier this year. The poll was released Monday, as the death toll in the current conflict soared. Monday Palestinians officials reported more killed, bringing the death toll to around 550. It's unknown how many were militants, but the United Nations has estimated that 70% are civilians. Israel announced Monday that seven more of its soldiers were killed, bringing to 25 the number of Israeli soldiers who have died. Two Israeli civilians have also been killed. 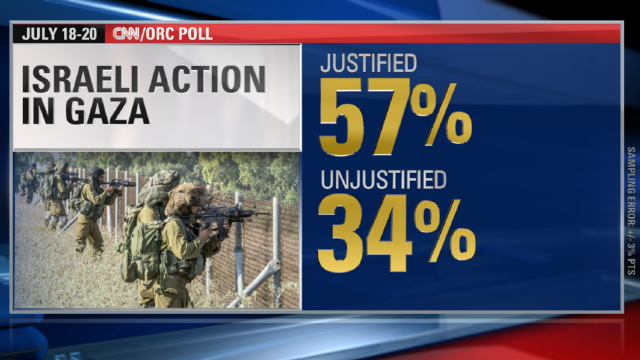 According to the poll, 57% of the public said the Israeli actions against Hamas, the Palestinian organization that runs Gaza, are justified, with just over a third saying they are unjustified. Forty-three percent of those questioned said Israel's using about the right amount of force, with 12% saying they're not using enough. Nearly four in 10 said Israel is using too much force in Gaza. "Attitudes toward Israeli military action have been extremely stable over the years," said CNN Polling Director Keating Holland. "In 2012, an identical 57% thought that Israel's actions against Hamas in Gaza were justified. And in 2009, the number of Americans who felt that way was only a few points higher, at 63%." "Support for U.S. military aid to Israel also remains fairly stable, with almost two-thirds of Americans saying that U.S. assistance to Israel should be increased or kept the same," Holland added. The survey indicates that 38% have an unfavorable opinion of Israel, up 14 percentage points from February. Sixty percent said they have a favorable opinion of Israel, down from 72% in February. But that 60% favorable rating is three times higher than the 20% of Americans who have a positive view of the Palestinian Authority, the governing body that runs the West Bank. If the bloodshed continues for a while, don't be surprised if some partisan bickering over the fighting in Gaza breaks out in the United States as the poll suggests a partisan divide. Forty-five percent of Democrats questioned said that Israeli's military actions in Gaza are justified. That number jumps to 56% among independents and 73% among Republicans. Really?! May I ask who are you polling? May I also ask, why are there all these protests all over the US and the world siding with Gaza? Nice job CNN in showing who you are bowing down to! Shame on you! Israel is sadly a land-grabbing, ethnic cleansing nation of thieves. It has no legitimacy. I believe it has no future since it's security is so dependent on the US. Our US policy is to provide security for thieves. There ultimately is no security for thieves. After 2 wars, and a generation of aligning our policies to their needs, we are broke. Support for these violators of the Geneva Convention has been disastrous to the US. Bush's 2 wars alone will cost $7 trillion. Israeli agents high-fived each other and filmed the scene on top of a rental truck when the twin towers were struck. The Muslim people do not oppose Israel because they are racist, or anti-Semitic, or Jew-hating. They do so because they are normal. Arguing that Israel has a right to defend itself is like arguing that any thief, axe murderer, or war criminal has a right to defend themselves. What Israel should do, in turbo mode, is cut a final deal (not a final solution) with the Palestinians that honors the dignity of their victims, before it talks about any right to defend itself. What guarantee did Israel have that the troops coming in from the sea weren't ISIL? I doubt these results. How could ordinary Americans support mass murder like this. F16 and artillery bombing innocent civilians! Bombs on even the injured on a hospital and red cross vehicles! What cowards acts. All the over 4000 killed and injured people in Gaza are civilians while the 300 killed or injured Israelis are all military elite IDF. Gaza militants are just more humane and fight a just war that was imposed on them and did not ask for it. Gaza militants are just defending civilians against an aggressor that is committing a genocide. Gaza people are just asking to lift the nonhuman blockade. Absolutely false!! American opinion is been lied about, they overwhelmingly side with Palestinian people who is facinf Israeli war criminals. The pols are manipulated in purpose to give the impression to the majority of people who are outraged that they are a minority so they will keep silent. American are on Justice side, in support to the victims of Israeli crimes. Stop lying CNN. Most Americans are not aware of Gaza (as shown in street interviews) and would support the bombing of anywhere. There is a huge disinterest in anything outside the US borders. If they knew the extent of the carnage, I doubt whether they would actually support the invasion. I believe Israel has the right to exist, just as much as a Palestinian state does. In fact, I think if you took Hamas and the other Islamic militant groups out of the equation on one side, and the extreme nationalist Israeli groups and their US supporters out on the other, the majority of Israelis and Palestinians could probably live alongside each other in relative harmony. I don’t believe Israeli forces are intentionally killing civilians but Hamas, like many other radical Islamic militant groups, has zero respect for civilians – including their own. Israel has a right to defend itself against terrorist attacks, that is something I firmly believe in and support. Unfortunately, non-combatants on both sides will die because Hamas has no problem firing rockets at civilian centers or using their own citizens as human shields. In other polls, Americans elected George W. Bush. Twice. America is the most uneducated country in the world when it comes to the occupation of Palestine by Israel. Palestinians are fighting for their lives against Israel. They have been systematically having their land stolen from them by Israel. The have suffered nonstop violence at Israeli hands. None of this is reported adequately, if at all, in mainstream American news sources. The American public is easily duped as they were over the invasion into Iraq. Most of our politicians have been bought off by the Israeli lobby in Washington. The be against Israel makes yourself a target in DC. This will continue to blowback on the US as we fund and supply the terrorist Jewish Nation of Israel while we pretend that you can build a Democracy while stealing land and persecuting Palestinians. Zio nism is simply wrong. Its immoral and falsely justified by a God that does not exist. I don't approve what Israel is doing. They are slaughtering innocent people by the hundreds. About 1/3 are children. 4 boys killed by a missile the beach? Israel has the technically to send in comandos to kill any and all people who are sending rockets(which 99%) of the time don't hit anything. And it's not always hamas. If anyone was locked inside a very small piece of land with milliions of ppl you'd be desperate too. Besides Israel controls the amount of water, supplies, etc. they gets by restricking shipments coming into Gaza. The shame on Israel and the shame on Obama and the shame on Israeli controlled US media. I wonder how they go to sleep at night. Before anyone judges Israel. Remeber this. If the precious united states had rockets fired onto their soil, thousands of civilians(purpose or not) would be killed in an immediate, aggressive, destructive retaliation. And not one of you would be sad about it. Don't be so hypocritical. Amen to that Southern Liberal! Thanks for that link you posted. As much as some, but not all, people on the left want Israel totally out of the region, it’s just not going to happen. Generation after generation have called that small strip of land slightly larger than New Jersey home. Thousands have fought and died in war after war to keep it from being overrun by Egypt, Syria, Jordan and other armies that have sought to wipe it off the map. To think that over 8 million people, including over a million and a half Arab citizens, will suddenly just up and leave is just naive and ludicrous. The logistics of uprooting and transplanting that many people would be extremely complicated, plus I can imagine most residents of Israel would think you were insane to even suggest it. What? Could you please get a new whatever language you speak-to-English dictionary, study it and re-post – in ENGLISH? I agree with you on that point. The biggest obstacle to peace right now is each government has their own extremist[s] in charge of running things. As much as Netanyahu complains about Hamas stating they have a goal of eradicating Israel, Netanyahu recently announced that his goal was the exterminate Hamas. That is about the time when 100+ rockets per day began flying towards Israel. John Kerry's most recent attempt at peace talks between the sides failed for one simple reason. Leaders on neither side want peace. They want complete extermination of their enemy. CNN has so many intelligent,knowledgeable posts here, I am very impressed by every one. I will be looking again. Only one Israeli has been killed in Israel, besides a few soldiers. And how many innocent Palestinians have been killed? Probably about 600 by now or more. Shame on Israel. btw there are many Israeli's who don't approve of this either and have been protesting in Israel. Many Jews outside of Israel are protesting big time all over the world. And in almost every Arab country there are Jews living in them. Morocco, Egypt, Turkey, Yemen, Iran, just to name a few. Probably in Jordan and Lebanon also. The Palestinians voted for Hamas specifically because Hamas wants to kill all Jews–it is written into the Hamas charter. I do not believe the world would benefit from another Arab state. Arab states are all dysfunctional, violent, hateful, fund terrorism, perpetrate terrorism, teach hate and radicalism, and have no freedom of speech, no freedom of religion, no equal rights for women or gays. I think Israel is a much-needed example of Western rights and freedoms in the part of the world that needs it most. I think those who support the Palestinians practice the soft racism of low expectations and are hate Jews for all the classical reasons, mainly to do with stupid stereotypes around money and related to their own feelings of inadequacy.